Is your cat too thin? Does she need to put a little “plump on her rump?” Then read on to find some simple solutions to Kitty’s supermodel-slender situation and how to help your cat gain weight. Before we go through the different options, the first thing to try in most cases is protein-rich wet cat food. A good option is the Purina Fancy Feast (see prices and customer reviews). The first thing you should do is find out why your cat is so thin? If your feline is older he may be suffering from hyperthyroidism. According to WebMD this condition is characterised by an excessive concentration of the thyroid hormone known as thyroxine-a. Another health issue, diabetes, can also cause excessive weight loss in cats. A simple blood test by your veterinarian can determine if your cat is suffering from either of these conditions. Does your cat spend time outdoors? Then she may have picked up an intestinal parasite that is leaching the nutrients from her digestive tract. Again, a visit to your veterinarian (with a fresh stool sample from your feline for testing) can determine if she has worms. If you have a younger cat or a kitten, she may be just burning off more calories that she’s taking in. However, before you make any dietary changes, be sure to consult with your veterinarian to rule out a health problem. To help your cat gain weight you may want to consider a dry kibble dietary change. Some lower-end cat foods are loaded with inferior products such as corn and the meat has been sourced from slaughter house rejects, dead zoo animals and even road kill. These ingredients offer no nutritional support for your cat and will affect the way it looks, feels and processes its food. To avoid these types of foods, read the label on the side of the bag for the nutritional makeup of the kibble. The first ingredient listed should be a pure protein source like beef, chicken, salmon etc. not a meat by-product or a grain. Cats also cannot manufacture taurine in their bodies, so be sure this important mineral has been added into the food. As stated above, we recommend you try the Purina Fancy Feast to begin with. You can help your cat gain weight by feeding him food made specifically for kittens. 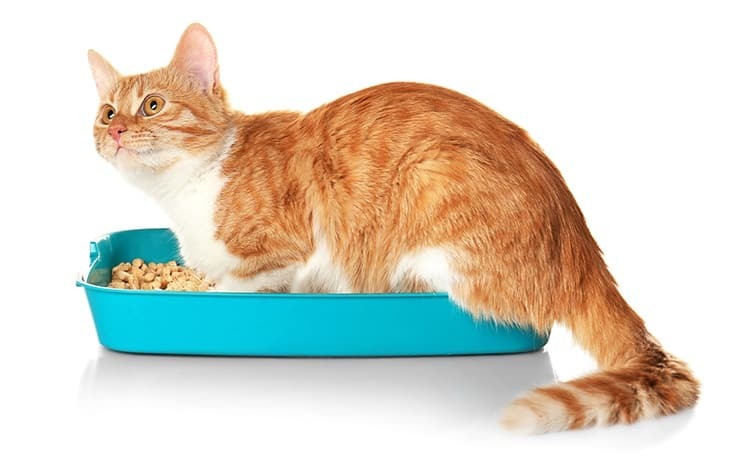 This kibble is higher in protein and calories and is traditionally used for kittens during the first year of their lives to help them grow and develop properly. But again, be sure to purchase the best quality kitten kibble you can afford. A good place to start is the Purina Pro Plan Focus Kitten Canned Cat Food. Most cats love the flavors, smell and textures of canned cat food. To help your cat gain some much needed weight, add a tablespoon or two to her kibble. This will help finicky eaters be more enticed to indulge in meal times, which will eventually add some weight to her frame. However, just like dry kibble, be sure the canned food contains whole proteins as the main ingredient, not grain or by-product fillers. These “junky” additives will help your cat feel full, but will do nothing for her overall health. All these foods provide your cat with a big protein boost and will help supplement her daily kibble diet. Raw Eggs. In this form eggs contain avidin (a protein) which can interfere with the absorption of Vitamin B.
Canned Tuna. A steady diet of canned tuna can lead to malnutrition. Can give kittens and cats diarrhea. Grapes/Raisins. Can cause kidney failure. Even food containing alcohol can be dangerous to a cat. In fact, just three teaspoons of whiskey can kill a five pound feline. Coffee/Tea/Cola. Any beverage that contains caffeine can be detrimental to a cat’s health. Contains theobromine which can lead to death in cats (and other animals). Yeast Dough. Even a bit of ingested yeast dough will continue to rise in your cat’s stomach causing severe pain. In addition, the fermentation process creates alcohol which can lead to death. Found in sugar-free candy, gum and toothpastes. When you begin the process of fattening up your cat, do so with caution. You want Kitty to go from too skinny to just right, not too skinny to too fat. Monitor your cat’s daily intake of calories and when she has become pleasant plump and at a healthy weight, don’t add in any more extra indulgences. If you need help finding the right balance for your feline friend, don’t hesitate to consult with your veterinarian. I would say this is a great tip for the cat to gain weight. It’s funny that I also found one guide to weight loss for cat https://thehealthystory.com/ultimate-weight-loss-guide/. When I had a sick cat, I would put canned cat food in the blender with a little water. Even with pate cat food, the cat would just lick at it. With it blended into a “meat smoothie” she’d eat a lot more. Dry food is never, ever good for cats. If your cat needs to gain weight. step up the portions of wet food and feed several small wet food meals a day. My cats do not like canned food. I’ve tried multiple brands, flavors and textures to no avail. They won’t have it. I feed them what I think may be a good dry food. I’m not a vet, so they get what I think is right for them from our local pet store. I may try the meat smoothie idea.